Carbon, nitrogen, iron, lead, gold, nickel, uranium … according to science, the majority of elements present in earth’s matter were a product of a cataclysmic Supernova explosion – or in other words – the destruction of a huge star. Thus when we hear that we are “star dust” we understand that every atom in our bodies originally came from a dying star. So … is it then such a big leap to entertain the thought that some of us could potentially be of extraterrestrial, or intergalactic origin? “Starseeds”, “Light-beings” and “Star Children” are all mysterious and fascinating terms that have become more and more popular and widespread in our language throughout the last few decades. If you were curious to discover the meaning behind these peculiar terms, or if you’re interested in discovering whether you could be a Starseed yourself, read on. In essence, people who identify themselves as being Starseeds believe themselves to be of extraterrestrial origin, or in other words, they have incarnated on other planets or solar systems, appearing on planet Earth in order to help humanity awaken and evolve. The Starseed generally possesses a strong life-purpose and a deep underlying feeling of having a mission to fulfill on Earth. Most people who identify as Starseeds also share the belief that they have not only lived on other planets before, but that their genes also possess extraterrestrially encoded DNA that influence their psyches in specific ways – this will be explored below. In essence, all Starseeds believe that they are here on Earth to serve as Spiritual Helpers of mankind. Unique physical appearance. For example; compelling eyes, atypical body structure, elongated necks, oddly shaped skulls etc. A sense of “not belonging” accompanied by feelings of isolation, alienation and loneliness. Attraction to the ethereal. For example; the sky, sun, moon, stars, planets, space. The feeling that Earth is not your home. The feeling that your biological parents are not your real parents. Low blood pressure and low body temperature. As a child you had many imaginary friends. Strong attraction towards healing and guiding careers. For example; psychology, counseling, teaching, child or disability caring, therapy, etc. High sensitivity to electricity and electromagnetic fields. The feeling of having lived many lifetimes. Regularly experience déjà vu and precognition. 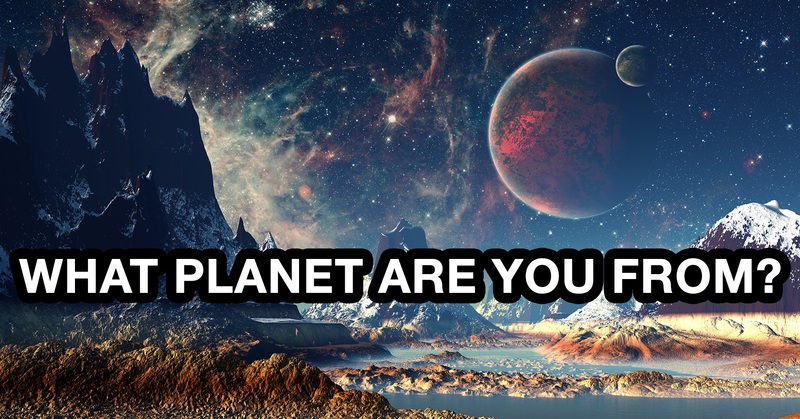 So, do you think you’re a Starseed? If you can say yes to most of those things, than you probably are one! But where does your soul originate from? Well, now you take the test and find out! And please let us know your result! Todd, bro, I truly wish all the best for you on your journey. But I also want to recommend that you not mention any of what you’ve just said on a first date. Hehehe Mathew ! Best response ! I have become awaken and educated. I do my best to connect with my powerful guides and Star beings who are vibrating with love and light in the higher dimensions that is called unknown but it’s a dimension of pure love and I am here in this mortal body that is my vessel. My first life on earth, first life from the Star planet and council that knows I am here. What I’ve seen, read, watched videos of people, mostly pale skin people working with the Pleiadians, Lemurians, Nordics and many more star beings. My brothers and sisters of Light and Love that are in the 5th dimension and all above. Don’t you think it’s time to work with all human colors, not just one race. My hands of healing are always vibrating and I love and miss the sun. The sun knows when the clouds are cold in the city I live in and will warm up the clouds with waves of hot heat. I met a loving being in person that gave me a reading. He was correct about everything and as of November 2018. My telepathy gift was supposed to activate and it never did. I have started a group on Facebook from 3 and now we are 20 from the same state. We are all brothers and sisters from different star planets. I always do my best to learn new ancient techniques and ancient technology techniques and share them with my group. We already had our first meet & greet which was last month and it was 7 of us. We will be having our second meet & greet this February so it would be nice if the Pleiadians and Acturians can take a trip to meditate with us instead of being at Washington State all the time. I know about my brothers and sisters in Inner earth and Hollow earth and tried to contact them all with meditation consciousness. We are all waiting for earth rebirth. I was meant for hands of healing power as a Pisces so if you can please help me to activate my hands of healing so I can start healing people. I do not seek popularity or money. I want to heal people for free. Today seems to be the day I fully awakened and realized all is not hopeless. At 61 years of age I have thought all my life I was sent here for a purpose. After finally finding my answers to my questions I feel I know what to do. To help others. I built a home (all by myself, as general contractor,tiny 500 sq ft don’t ask how it’s still a mystery to me) on a huge property so many people can come up and camp and raise our vibration. What a ride it’s been to get here. From the depths of absolute desperation I have been yet always thinking there is a reason. Humans should not have to suffer and be in such fear. After I moved in I knew I was ready for the answers, I had made it here it was time. I feel elated knowing what I have gone through was for a reason. I am ready. i got told this by the resuts haha, anyone want to help me decifer it?